Is There a New Puppy or Kitten Under Your Tree This Year? (NewsUSA) - The holiday season is a popular time for spending and gift giving, there's no doubt about it. Spending on pets is no exception. According to cat and dog breeders, mid-December is their busiest time of year. Families plan for the arrival of new puppies and kittens during their school-aged child's winter break from school, to give them ample time to spend with their new four-legged friend. When welcoming a new puppy or kitten into your home, it's imperative to plan for their health expenses, too. You wouldn't want to ruin your holiday budget on an unexpected veterinary bill for the new addition. Puppies and kittens are prone to accidents and illnesses in their first year of life as they explore the new world around them. Trupanion reports they have paid over 15,000 claims related to new puppy and kitten accidents and illnesses. These cost pet owners across North America over $1 million in 2013 alone. Most common health issues for puppies. 1. Foreign body ingestion. Average cost: $1,400. 2. Cruciate rupture. Average cost: $2,400. 3. Injuries sustained after a traffic accident. Average cost: $1,750. Most common health issues for kittens. 2. Urethral obstruction. Average cost: $1,000+. 3. Upper respiratory infection. Average cost: $200. It's best to enroll the critter in pet health insurance at a young age, which can soften the blow of veterinary expenses to help give families peace of mind -- especially during the already stressful holiday season. 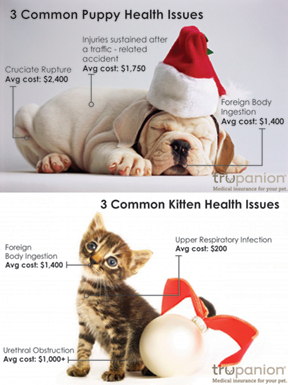 For more information on pet health insurance for your new puppy or kitten, please visit Trupanion.com/mynewpet.